Capsicum’s off to Clarissa Stead. At Morning Glory Farm in Edgartown the summer’s undulating sea of cornstalks and striated expanses of green have given way to the frost-kissed and fallow soil of fall. A biting damp wind sweeps over the fields, heralding months of cold privation. It would appear that this year’s harvest is over. 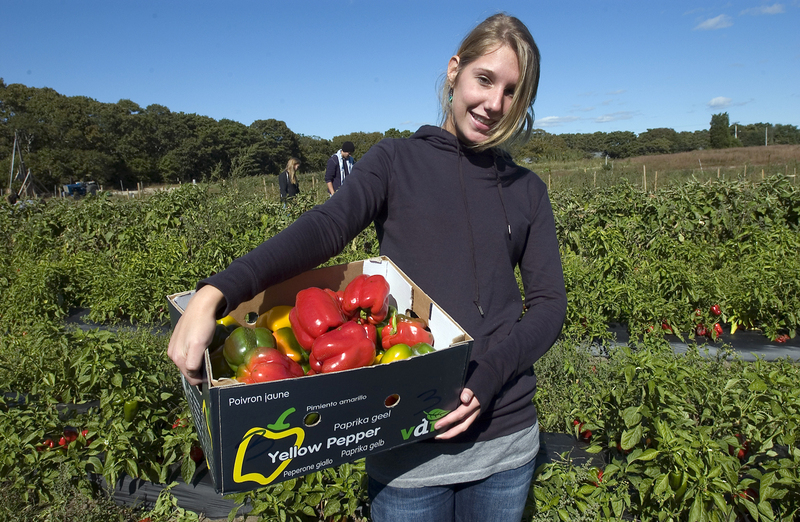 But for a group called the Martha’s Vineyard Gleaners, it is just beginning. “Gleaning is an old agricultural tradition in which farmers would open up their fields after they did their harvest, usually to the needy in the community, to pick what’s left,” said Noli Taylor, coordinator for Island Grown Schools. At the end of the harvest season on the Vineyard, when farms lose both their summer labor and a significant portion of their market in summer visitors, many farms simply plow unharvested crops into the ground. To prevent this wasteful practice the Island Grown Schools program — a project of the Island Grown Initiative that provides local, fresh food to Island school systems and connects students with their agricultural heritage — has teamed up with The Sowing Circle, a women’s agricultural society, to recruit members of the community to gather this leftover bounty from both private and commercial farms around the Island for use in the community. This year’s has been a bumper crop. That day’s harvest was especially prodigious. Produce rescued from the oncoming frost included some 400 ears of corn, 300 pounds of peppers, 360 pounds of eggplant, an “uncountable” amount of lettuce and a smattering of tomatillos and hot peppers — all of which would have been ruined by frost in the coming days. And imperfect crops that retain all their nutritious value but otherwise would be difficult to sell at market can be put to good use in school lunch programs. The crew responsible for reaping the impressive yield at Morning Glory included 22 students from the high school leadership class as well as 15 volunteers from the greater farming community. “It was really amazing,” said Ms. Taylor. 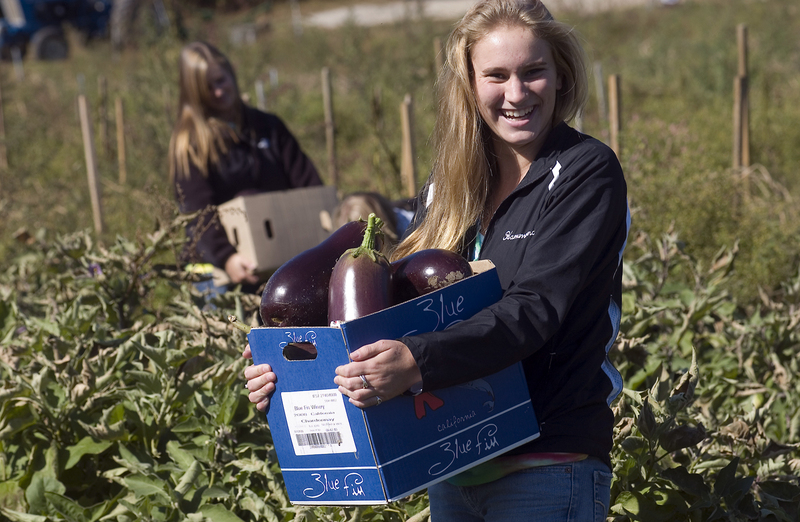 In fact, this first season of gleaning has been such a success that a program originally intended to provide fresh Island food to the Tisbury, Edgartown, Oak Bluffs and public charter schools has expanded its reach to provide surplus vegetables to the Edgartown senior center, Island Elderly Housing, the Dukes County jail and the high school culinary arts program. In addition, each volunteer at the Morning Glory event was able to take home a personal stash of produce. On Tuesday from 9:30 a.m. to 1 p.m. there will be another glean at Morning Glory Farm. Volunteers are welcome. Although tender crops like corn and peppers are done for the season, hardier cool weather crops like root and cruciferous vegetables are still thriving. Next Tuesday’s gleaning is expected to turn up a thousand pounds of potatoes. For students recruited to glean, the events are about more than just an opportunity to gather crops. The Island Grown Schools program seeks to get young people involved with local food production, and these outings provide adolescents an opportunity to get in tune with the seasonal rhythms of agriculture. For others the outings are an academic affair. Next week students from a ninth grade American history class plan to participate in a gleaning event to illuminate the more workaday operations of the Jeffersonian agrarian ideal. While gathering crops they would be proud to know that its namesake exponent considered cultivators of the earth the most valuable citizens.